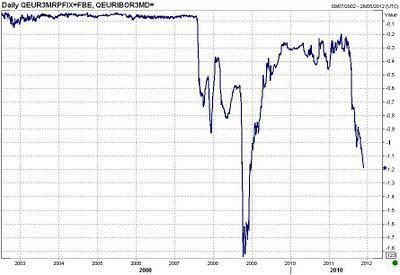 Is The Eurozone Banking System About To Collapse? Senior analysts and traders warned of impending bank failures as a summit intended to solve the European crisis failed to deliver a solution that eased concerns over bank funding. The European Central Bank admitted it had held meetings about providing emergency funding to the region's struggling banks, however City figures said a "collateral crunch" was looming. "If anyone thinks things are getting better then they simply don't understand how severe the problems are. I think a major bank could fail within weeks," said one London-based executive at a major global bank. Many banks, including some French, Italian and Spanish lenders, have already run out of many of the acceptable forms of collateral such as US Treasuries and other liquid securities used to finance short-term loans and have been forced to resort to lending out their gold reserves to maintain access to dollar funding. Bank deposits with the ECB now stand at their highest level since June 2010 at €905bn (£772bn) as lenders withdraw deposits held with their peers and put them into the central bank. At the same time, banks in major eurozone countries such as France and Italy have become increasingly reliant on central bank funding. This follows the trend seen in smaller countries like Ireland where lenders have effectively becomes taxpayer-funded "zombie" banks. While policy is decided centrally, actual enforcement and implementation of that policy is conducted on a national central bank (NYSE:NCB) level. That means every NCB is in charge of providing liquidity to its own particular market. The Irish NCB’s routine distribution of emergency liquidity assistance (ELAs) on a near enough unilateral basis (there’s only the need to notify central command in Frankfurt) is a good example of how the system works. All payment surpluses and deficits created as a result of these unilateral NCB processes are then balanced out via the so-called Target2 system (Trans-European Automated Real-time Gross settlement Express Transfer system). Generally speaking, the system ensures that all NCBs carrying surpluses channel them over to NCBs carrying deficits. The problem is that since the crisis unfolded, the number of NCBs handling deficits has started to outnumber the number of NCBs holding surpluses. One particular NCB — the Bundesbank — has become the key provider of funds to the whole eurosystem. In order to fund these loans, the Bundesbank sold its holdings of German assets. Asshown in Figure 1, between December 2007 and September 2011 the central banks of the GIIPS increased their loans to domestic financial institutions by nearly €300 billion. 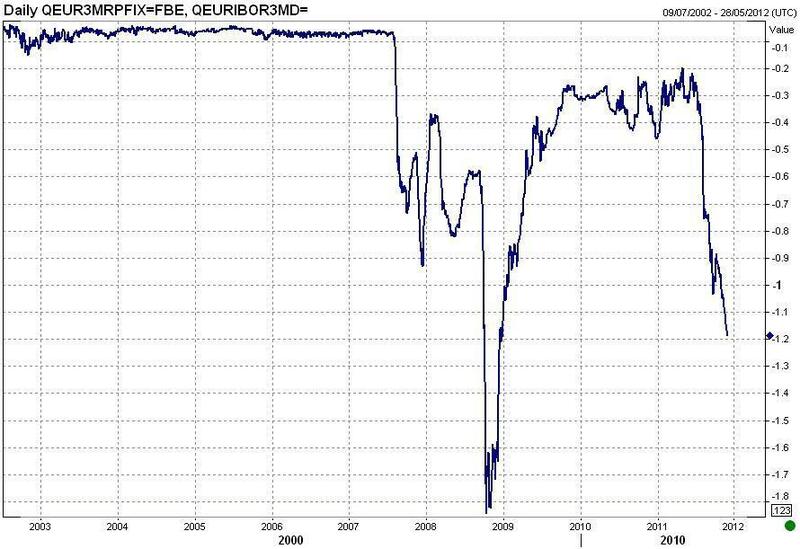 In contrast, the stock of gross German assets in the Bundesbank balance sheet fell sharply to its lowest level in history. The ominous sign – which might set the stage for Act Two in the unfolding Eurozone drama – is the fact that the Bundesbank will soon exhaust the stock of securities that it can sell to fund further loans to the Eurosystem. At that point, the Bundesbank could sell its gold or increase the deposits it takes from the private sector. Most likely, however, the Bundesbank will face strong pressure from the German public against such action. The Bundesbank having to sell its gold to fund banking liquidity??? That will make Merkel sit up and take notice. While soaring Libor rates were a key indicator of market stress during the credit crunch, the best indicator of collateral crunch intensity is instead the repo rate. The lower the rate, the greater the crunch. [W]hile the ECB’s haircut policy might have been seen as prudent at the time, in a single monetary union — where markets are already reflecting preferences for certain types of Eurozone debt — having the ECB treat government collateral differently only intensifes the phenomenon. The ECB should, by all definitions, treat all government debt the same. [T]here are many reasons to think that the trend towards ‘quality’ collateralised funding is having as much of an impact on the valuation of bonds in both private and central bank funding markets, as the perception that European sovereigns might be insolvent. This has the makings of a Lehman moment for the European banking system. Here are some of the signs of a imminent bank collapse. First, I would continue to watch for signs of stress in the money market, such as the LIBOR vs. the secured (repo) spread. For investors without access to Bloomberg and other services with money market data, here is a quick and dirty way of watching for signs of rising stress in the banking system. Watch the stocks of stressed banks. There are four that appear to be under severe stress from a list that I detailed previously here. The first is Commerzbank (OTCPK:CRZBF), which has already undercut its Lehman Crisis 2009 lows and is in the prospect of testing its recent lows as another support level. If that low doesn't hold, then that may be one of the first Signs of the European Banking Apocalypse. I would also watch the shares of Credit Agricole (OTCPK:CRARF), which has also been subject to rumors of severe banking problems. Societe Generale (OTCPK:SCGLF), another French bank, has also been the subject of insolvency rumors. In all cases, these banks have undercut their 2009 lows in 2011, but SocGen shares have managed to rally above that level. In all these cases, the shares have fallen below their 2009 Lehman Crisis lows in 2011. In all but one, they are in the process of testing the 2011 lows as the final support - a sort of final trip-wire to a European banking crisis. As many of these stocks trade in ADR form in the US, many of my American may be tempted to monitor the performance of the ADR instead. I would recommend that you watch the euro-denominated price as that is more liquid and I have provided the Yahoo finance link to those prices. There are a number of other troubled bank stocks to watch, but these have not undercut their 2009 lows. In no particular order, these include the Royal Bank of Scotland (NYSE:RBS), KBC (OTCPK:KBCSY), Unicredit (OTC:UNCIF), BNP Paribas (OTC:BNOBF) and Banco Santander (OTC:BSTNF). Disclaimer: Cam Hui is a portfolio manager at Qwest Investment Fund Management Ltd. ("Qwest"). This article is prepared by Mr. Hui as an outside business activity. As such, Qwest does not review or approve materials presented herein. The opinions and any recommendations expressed in this blog are those of the author and do not reflect the opinions or recommendations of Qwest.